The nation’s electronic-scooter companies are facing more blowback as concerns rise about the devices’ safety — this time in the form of a class-action lawsuit. The suit also alleges that Bird and Lime scooters contain defective electronics and mechanical parts, as well as inadequate safety instructions for riders, and that the companies have “a wanton disregard for the safety of others.” The suit says the risks posed by the devices “were known and/or knowable” based on “professional knowledge” within the transportation community. The suit makes numerous claims about scooters’ mechanical issues but does not provide concrete evidence for those claims. The suit also names scooter manufacturers Xiaomi United States and Segway as defendants. “While acting under the guise of the commendable goals of furthering personal freedom and mobility and protecting the environment, the defendants ... are endangering the health, safety and welfare of riders, pedestrians and the general public,” the suit alleges. A spokesperson for San Francisco-based Lime said the company is reviewing the complaint. Spokespeople for Segway and Xiaomi United States did not respond to requests for comment. Since their sudden arrival in recent months, e-scooters have been linked to an uptick in severe injuries around the country, according to emergency-room physicians. As the value and popularity of companies such as Bird and Lime have soared, a growing number of critics — including doctors, former riders and scooter mechanics — allege that e-scooter fleets are poorly maintained and prone to dangerous mechanical failures. Two e-scooter riders — one in Dallas and one in the District of Columbia — have been killed in accidents, authorities say. The class-action suit adds a new category of people to the list of those fiercely opposed to the latest form of controversial transportation sweeping the nation: pedestrians. Among the plaintiffs is David Petersen, a 62-year-old street performer known as Davy Rocks, who says he was struck by an e-scooter rider in June and severely injured. Petersen said that he was dancing for onlookers near the Santa Monica Pier, clad in his trademark “gladiator outfit,” when a man on a Bird scooter hit him from behind. The man fled the scene, he said. He said that the force of the crash knocked him down, but that he managed to lessen the impact by catching himself with his right hand. Had he been an elderly person or a small child, he said, he could have been killed. Petersen said he suffered a fractured arm and severed biceps. The injury caused him to miss weeks of work, and the muscle had to be surgically reattached using a cadaver graft, he said. Additionally, the lawsuit accuses Bird and Lime of multiple breaches of their warranties and alleges that their vehicles were “not suitable” for repeated use in public places. Stating that the deployment of e-scooters is unlawful, the suit said each company should be prohibited from continuing to deploy scooters in California. Beyond seeking damages, the suit said scooter companies should be required to include “adequate warnings and/or instructions” on their apps and vehicles. 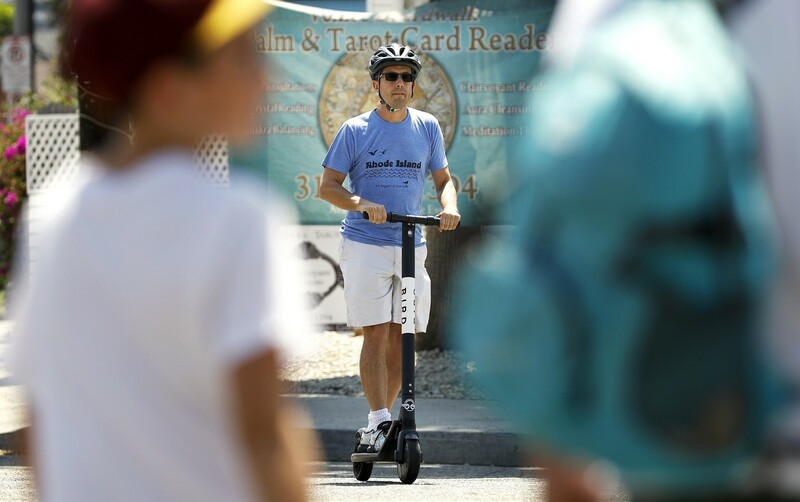 Catherine Lerer — a personal-injury lawyer from Santa Monica who with lawyer Jeffrey Lee Costell is representing the plaintiffs — said she has received more than 100 calls from people injured by scooters in recent months. Whether they involve riders or pedestrians, she said, the injuries are consistent: broken noses, legs, arms, wrists, hands and ribs, as well as head injuries and tears to anterior cruciate ligaments and rotator cuffs that require surgery. “We filed this class-action lawsuit against Bird and Lime and the manufacturers of their electric scooters to address the terrible injuries they have inflicted on their riders and pedestrians, and the continuing harm they are causing,” Lerer said. Holley writes for the Washington Post.